We are getting a wintry mix storm. Whether you get snow, ice, rain or a combo of all 3 depends on where the freezing temperature line moves. Good weather for lighting the wood cookstove and making a pot of chilli. Simmered for a few hours and then bake biscuits to go with it. Cooking on top of the stove is easy. You move the pot to an area with the desired heat. Cooking in the oven requires a little more attention. Especially for biscuits which need a high temp. Today I had too leave them in a little longer as I didn't hold the required temperature. They turned out fine. Chilli and biscuits was a perfect meal for this kind of weather. Awesome set up! 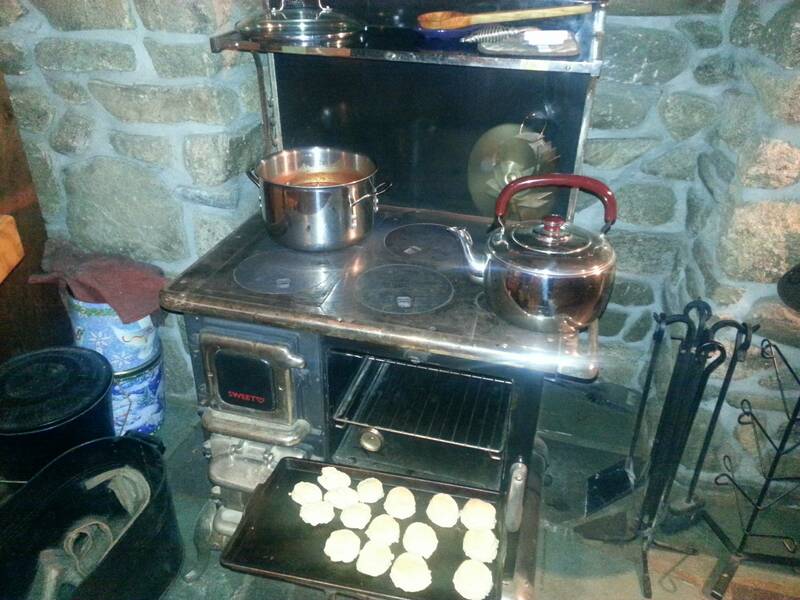 We actually still have the original wood burning cook stove in our family home. Sits right next to the electric lol. My great aunt still uses it when cooking large meals. Wintry mix of snow and chili cannot be be beat. Heat oil until shimmering. Sautee pepper and onion until soft. Add remaining ingredients EXCEPT kidney beans. Stir. Bring to a simmer. Cover and let simmer 40 minutes. Add kidney beans. Simmer additional 30 minutes uncovered. Transfer to bowls, top with shredded cheese. Serve with bread, biscuits or tortilla chips. Notes: How much chilli powder you use is up to you. My wife is a gustatorial wimp so I actually use less while cooking and add cayenne powder at the table. If you do not have chilli powder you can substitute 1:1 cayenne pepper powder and cumin. I often do that but with less cumin as I find the taste overwhelming. My wife would prefer more cumin as she likes the taste. Length of cooking can be subjective. This is a minimum. You can simmer it as long as you like to let the flavors mix and to thicken it up. You can put the kidney beans in any time but they can get mushy if overcooked. Recipe looks pretty similar to the one we use (though we don't use a Bell Pepper, am now thinking we should add one or two of them into the mix). This morning I diced up the onion, then lightly browned up the diced onion in a pan. Everything then gets put into (and thoroughly mixed together in) the Crock-Pot and allowed to cook for about 6 hours. The wife and Alpha like a small bowl of chili with grated cheese on top, plus a chili cheese dog or two on the side. Me, I like a large bowl of chili with grated cheese on top, with crust bread (buttered) served on the side. I guess we get 3 good meals worth out of the above recipe. Normally the 3rd and final meal is chili cheese fries. Can't wait to make mine next month. It'll be my first.